change your nick to Big Softy Dave? I'm only 167cm, so ... twerpy little softy with the annoying voice? But I don't think it will fit inside the character limit. 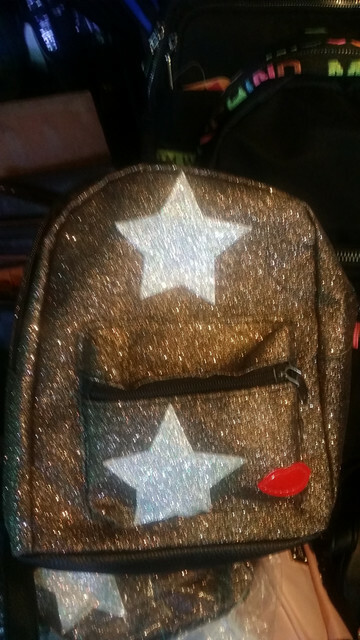 Btw, there is at least one glitter backpack at Central Market. Now they want me to get their mom a coffee mug that says "Mom" or some variant. Easy-peasy on the 'web, but I can't find mugs with anything printed on them, anywhere in Phnom Penh. Ideas? DisPlay design store on St 63 maybe? I guess if it's for a girl aesthetics are important so this might not be pretty enough, might sound obvious but had you thought of just buying a nice hardcover notebook, finding a shop with a drill press, paying them for a hole, and sticking a $2 dollar padlock through it? I had thought about that, yes. But without intending to be, or realizing it, these are *very* demanding kids. The boy has decided that I'm going to get him an "800 piece Lego Minecraft set" (now that DHL has decided that his Minecraft bow and arrow is "a weapon" and won't deliver it). Dangerous Dave wrote: I had thought about that, yes. But without intending to be, or realizing it, these are *very* demanding kids. The boy has decided that I'm going to get him an "800 piece Lego Minecraft set" (now that DHL has decided that his Minecraft bow and arrow is "a weapon" and won't deliver it). I feel bad. You are putting far more effort into presents for these kids than I am for my own kids. I love, love, *love* these kids. But it's my first Christmas "with kids" and ... it's not going very well. Btw, Kiwi, it was you who was looking for a glitter backpack, wasn't it? Did you see there's one at Central Market? Dangerous Dave wrote: I love, love, *love* these kids. But it's my first Christmas "with kids" and ... it's not going very well. Nope I’m looking for the diary, got some family in NZ to send it up for me in the end. Will see if it survives the Cambodian post system.